You are here: Home / Ent. / Soulja Boy Tell ‘Em. 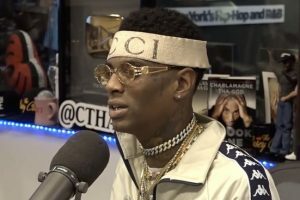 (ThyBlackMan.com) The rapper Soulja Boy was recently interviewed by DJ Akademiks and it has gone viral all over social media as the rapper makes aggressive claims of giving birth to a lot of well-known rappers, careers even down to the B-list rappers such as Tyga, Sean Kingston, etc. The problem is, although his alleged hierarchy claims in this rap game may possibly be true, his message delivery is too loud and therefore is not being heard or considered as facts. Although during this heated interview, he denies ever using narcotics but willing admitted to smoking weed and occasionally sipping lean which is a mixture of cough medicine, soda and codeine. I’m not sure if that question in the interview about Soulja’s alleged drug use was intended to explain the rapper’s aggressive behavior towards the interview panel at the time or just to openly clarify some past rumors about the rapper. We’ve seen the black community tear down Whitney Houston about her alleged drug usage at the time and clearly, Soulja’s, PR or manager needs to really talk to him. The rapper’s behavior throughout the interview was not fully comprehended because he spent most of it name dropping to justify his points. The names that he was dropping for the most part, was not relevant to the hip hop culture today and could not be validated because before the interviewer could get clarity on any one thing said by the rapper, he had name dropped three more people name. My favorite part of this interview and clearly the black community of entrepreneurs on social media, was when the young lady who was a part of the interviewpanel, randomly shouting out questions but not really getting any responses from the rapper, asked him, “Why do you have so many businesses.” The clapback that the rapper gave her immediately was, “……I’m trying to be a billionaire……Why don’t you have so many businesses.” So many thoughts come to mind with that clapback. For starters, we have been conditioned to take what is given to us, be appreciative and learn how to survive as a people from it. Systematically oppressing black people is not a newsflash and it is our own people sometimes who put us down. Not everyone will be or needs to be an entrepreneur and that is to be respected. But building wealth in our own communities is something that us as black people need to commit to daily. Putting money back into our communities, enhances our lifestyles as a culture. Slavery taught us how to compete with each other to get “massa’s” craps at the end of the day or a space in his house. Again, Soulja’s delivery was partially all wrong, but he was speaking some truths. You can definitely feel the passion in his voice as he tries to educate the interview panelists but the information he was providing, just wasn’t received. He also talked about how we are so quick to buy from major brands who are owned majority by his male counterparts or someone older, but yet, we won’t support him as a young black entrepreneur. But these same companies that we often times support, are the same ones that are buying his products in the back office so to speak and no one knows about this. Why is that? Why do we support people who don’t look like us and will never know our struggles? Regardless if Soulja put on one person or 300 people in the rap industry, is irrelevant but more importantly, he has a message that needs to be heard overall and maybe someone who society will listen to (Jay Z, Nas, Diddy, Russell Simmons, etc. ), needs to pull this brother to the side and mentor him, just a thought.